Granny, Mamaw, Meemaw, Mimi...not matter what you call them, grandmothers are something special, aren't they? If you've had a grandparent or grandparents as a part of your life, you should consider yourself VERY fortunate. I am so very thankful for mine. I never got to meet my maternal grandma but my paternal granny (Janice) played a HUGE role in my life. Whenever I need a little wisdom or help putting things in perspective, I talk to Granny. She is someone that I have been able to tell anything to and I know without a shadow of a doubt that those conversations stayed between the two of us. She is a feisty lady. You shouldn't ask for her opinion on anything unless you're prepared to hear the truth! I take after her in that department and several more. She made sure my rear was in church every time the doors were open. She taught me to cook and to be resourceful. And boy, is she tough. A real mountain woman for sure. Up until the past few years she could work circles around me. That toughness may play a part in her not being an overly emotional person. I had never seen her cry until my mom died. I believe that was the most she had ever hurt. She didn't cry because of her pain but because of ours. Despite her toughness, I never, not even once, doubted that she loved me or the rest of us. Our family got some earth shaking news this past fall. Granny had been having some issues with arthritis but she started feeling poorly beyond just that. A doctors visit revealed liver cancer. I believe we took the news much harder than she did. She told them that she didn't want to go through treatments. I thought I knew how tough she was but I hadn't seen even a glimpse of how strong she really is. She doesn't complain. She has a great attitude. She is an amazing woman. 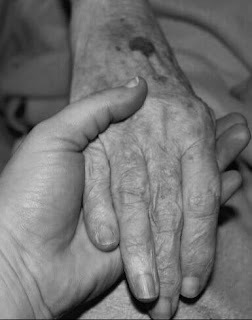 I wanted a picture of me holding my Granny Janice's hand. I'm so thankful she was with us for another Christmas & that I could take one. With this sweet hand my Granny has wiped a lot of tears & noses, worked hard to provide for her family, cooked the best foods that I've ever eaten, played some of the most beautiful music on the piano that I've ever heard, and been there to pull me up whenever I've been knocked down. She has been much more than my Granny...she has been my mom too. I'm sure that many of you wonderful memories of times spent with your grandma, grandpa, or both. I treasure each and every moment that I spent with mine. I welcome you to share any of your favorite "Granny Memories" with me. Just leave them in the comment section below.